First came the Persian army of Chosroes II, that sacked Jerusalem in A.D. 614. 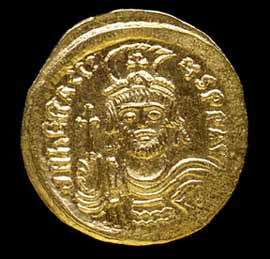 Eight years later the emperor Heraclius did re-capture the city, but respite for the Byzantine world was brief. In A.D. 638 the forces of Islam swept westward and overwhelmed the entire eastern Mediterranean shoreline. In the battle-strewn landscape that once had been Rome's eastern provinces, glassworking reverted more and more to a local craft level. New centers of glassworking emerged throughout Iran and Iraq, seeking now to satisfy the needs and tastes of Baghdad, not Constantinople. And many glass workshops were kept busy, making lamps for the thousands of mosques that were constructed in the Islamic world over the next few centuries. Traditional "bowl-and-stem" lamps continued to be popular throughout the Islamic era. But Islamic glassworkers, like their Byzantine counterparts, were always willing to adapt household glassware, such as wine vessels, into lamps any way they could.